Ponant Cruises’ first polar exploration vessel, Le Commandant Charcot, had her traditional steel cutting ceremony on 6th November. The ship will bear the name of a great French explorer with a true passion for sailing and an emblematic figure of French polar expeditions. Scheduled for delivery in 2020, the Vard Shipyard in Tulcea, Romania, (a subsidiary of Fincantieri) is building the LNG powered and PC2 Polar Class certified ship. Ponant also announced in November that it had teamed up with Chantiers de l’Atlantique to test out the innovative Solid Sail system on the cruise operator’s sailing vessel Le Ponant. Introduced as part of the sailing cruise-vessel project Silenseas, launched two years ago by Chantiers de l’Atlantique, the revolutionary Solid Sail concept has been tested on the 1,189gt/1991 built Le Ponant since 31st October. Two patents were filed in 2009 and 2017 for the new type of sail, made of fibreglass, carbon and epoxy-resin panels in a carbon-slat frame. This new technology will significantly reduce energy consumption tied to propulsion, and thus considerably reduce the environmental impact. These solid sails on the three-masted vessel have a total surface area of more than 300 m2. On 14th November came the news that the 20th November sailing of Le Soléal had been cancelled to assess damage and carry out any necessary repairs to the ship. On that day the vessel suffered a technical incident, while under the control of a Chilean pilot, as she sailed through the Kirke Passage in Chile, and one of her propellers was damaged. The 10,992gt/2013 built ship made her way, unaided, to Puerto Natales for assessment and repair with only the one departure from Ushuaia on 20th November being cancelled at the time of writing. The ship was due back in service on 30th November at Ushuaia. The game-changing 130,818gt/2018 built Celebrity Edge arrived at her new home, Port Everglades’ Terminal 25 (T25) in Fort Lauderdale on 19th November with Captain Costas at the helm following her first 15 day transatlantic crossing from St. Nazaire, her birthplace. Lining the decks as the Celebrity Edge entered the approach channel for the first time were more than 1,400 excited crewmembers (above). After the arrival, T25 was officially opened. The Celebrity Edge had embarked upon her more than 4,000 mile transatlantic voyage from the Chantiers de l’Atlantique shipyard on 4th November and made a technical stop in the Azores on 7th November. 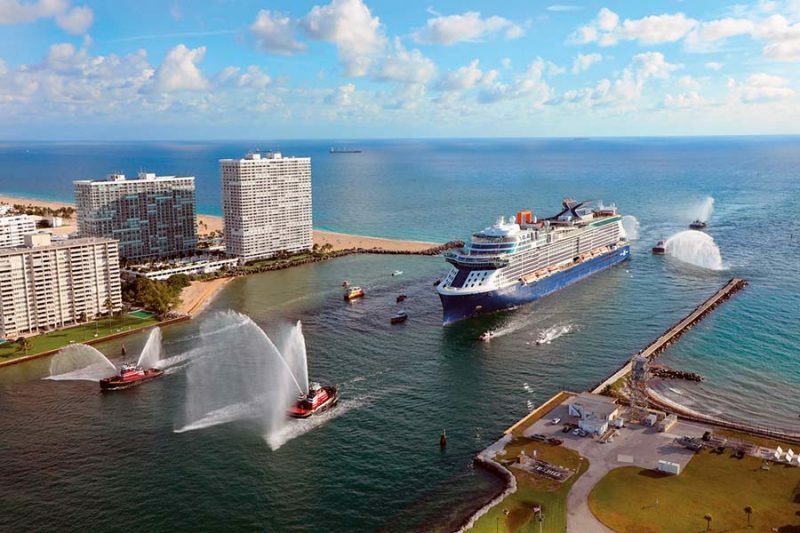 The new ship began her inaugural season sailing alternating seven-night eastern and western Caribbean cruise itineraries on 9th December and in spring 2019, the Celebrity Edge crosses the Atlantic again to offer Mediterranean voyages. Sister vessel Celebrity Apex will arrive at Southampton for the 2020 season and she will be joined by the ex-refit 122,210gt/2011 built Celebrity Silhouette, fresh from her Celebrity Revolution overhaul. The Celebrity Edge will also join her sister, the ‘Apex, in the Mediterranean that year.